Preheat oven to 180C and line a baking tray with greaseproof paper. Place salmon in the oven, skin side down, and cook for 8 minutes whilst you prepare the salad. Cook the soba noodles according to packet instructions. If you don’t have a spiralizer you can make the noodles using a vegetable peeler. Use the vegetable peeler to slice down the full length of the zucchini, rotating the zucchini as you go so the ribbons are similar in size. Once you have peeled the entire zucchini, stack the ribbons, then using your knife slice in long, thinner strips to create the noodles. Combine zucchini noodles, soba noodles and coriander in a bowl and toss to combine. Whisk together the remaining ingredients and pour over the noodles, tossing to combine. Remove salmon from oven and allow to rest for a couple of minutes while you prepare the spinach. Heat a drizzle of olive oil in a large frying pan and add the spinach. Use tongs to toss the spinach until it is wilted. Remove from the pan and transfer to a bowl. Toss through the crushed walnuts and a teaspoon of tamari. 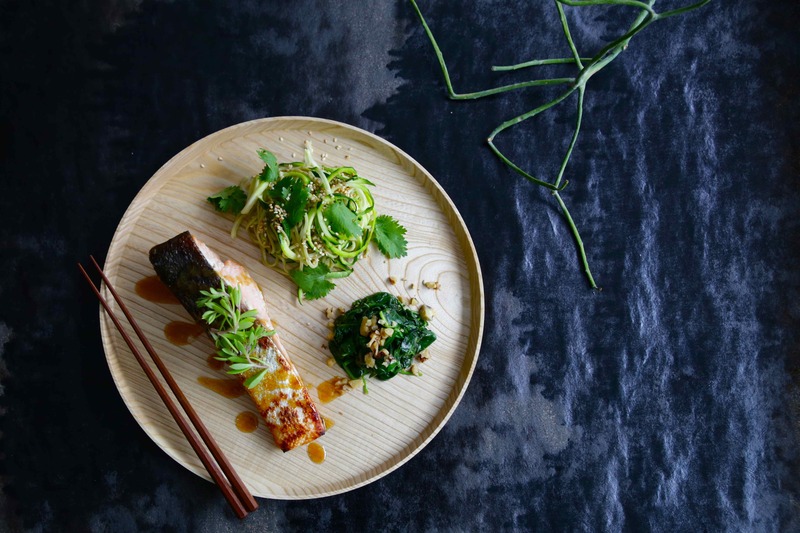 Arrange zucchini noodles on the plate, spoon half the miso drizzle onto the plate, place fish over drizzle and then pour the remainder of the miso over the fish. Sprinkle the fish with sesame seeds and serve with a wedge of lemon on the side.